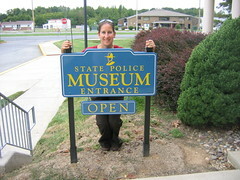 We’ve been to several police museums on our journeys and the Delaware State Police Museum did not disappoint. We were treated to the usual uniform displays, handgun displays, and continuously running multi-media presentations about the history of the State Police in Delaware. There was also a large display of police vehicles (cars and motorcycles) that replaced the traditional mounted police. In the back was probably the largest collection of police lights and sirens in existence. I tried to dutifully read the tags describing the shape, years used, wattage, major reasons for stopping use, etc. but it all started to run together in one big blob of shiny silver with red lights. I think I was actually hypnotized at one point. The best part of the museum was a “you be the detective” scene. A small display depicted a house that had been the scene of a heinous crime in Delaware history. There was also a large volume of notes to read (but we tried to be “Cliffs Notes Detectives” instead). 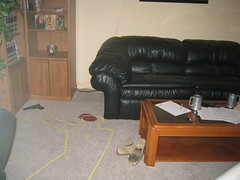 The crown jewel was a large mock-up of the room where the murder took place complete with body outline, blood spots and spatters, and other “clues” that we were supposed to use to solve the crime. However, as with many of the attractions that we stumble upon, some of the signage seemed to be missing, there were some lightbulbs out and even some missing multimedia presentation, so the killer may still be at large.